October is one of my favorite months. Down here in Virginia, it’s when Fall really kicks off. The weather catches up with the calendar– cool breezes roll in, the sun’s out, leaves are turning. Every where you look is a work of art. It also means it’s time for some of my favorite seasonal activities. Jumping in leaf piles. Hayrides. Apple cider donuts and apple picking in the Blue Ridge Mountains. Carving pumpkins fresh from the patch– just to name a few. It’s the official beginning of the best time of the year- several magical months full of tradition, family, and tons of memories being made. It also gives me the excuse I need to bake, bake, bake, and bake some more. Not that warmer weather really ever stops me from baking, but the cooler temps keep the whole family from whining and complaining about the oven on. Something about it making the whole house unbearably hot, and they’re going to melt– blah, blah, blah. Anywho- cooler weather equals more baking, less (you get the picture). The seasonal flavors on hand are also a particularly special set. Rich, earthly flavors and spices that speak straight to your soul. Cozy, comforting medleys. 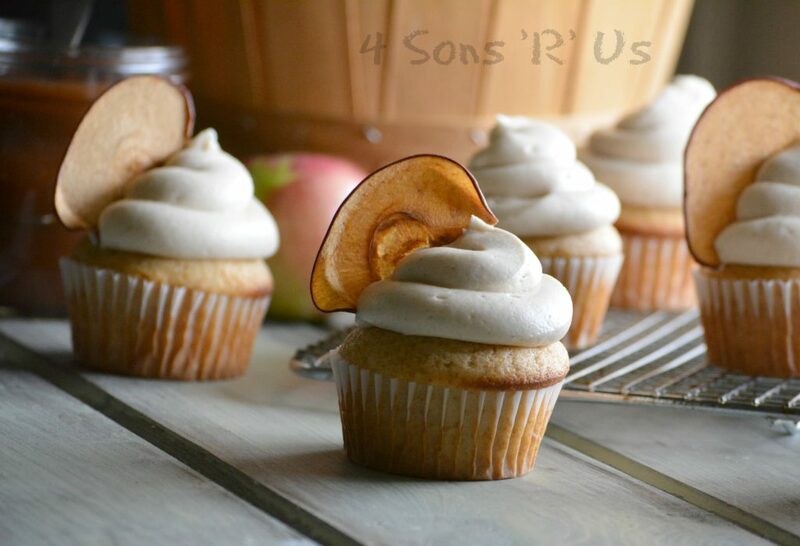 These Apple Butter Cupcakes With Cinnamon Apple Cream Cheese Frosting take ‘seasonal’ eating to a whole new level. 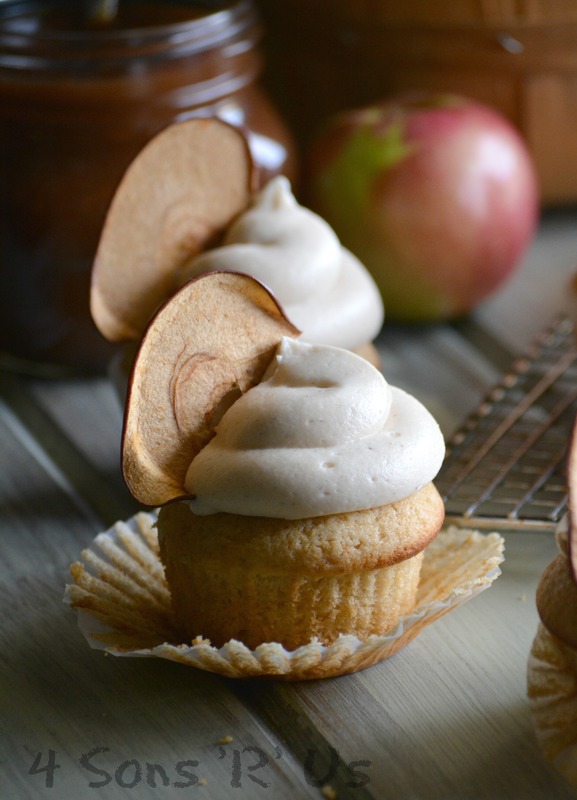 Soft, moist apple butter flavored cupcakes are topped with a fluffy, whipped cinnamon and apple flavored cream cheese frosting. Top them with an apple chip to give them a professional look that will be sure to please any guests you’re entertaining. These are the kind of thing you’ll want to share with everyone you know. Except they’re so yummy, it’s hard to stop at just one and the impulse to horde them will be equally as strong. So yes, for me, that means give them away before I eat them all. However you decide to enjoy them though, they’re a yummy way to add a little extra something special into an otherwise ordinary day. 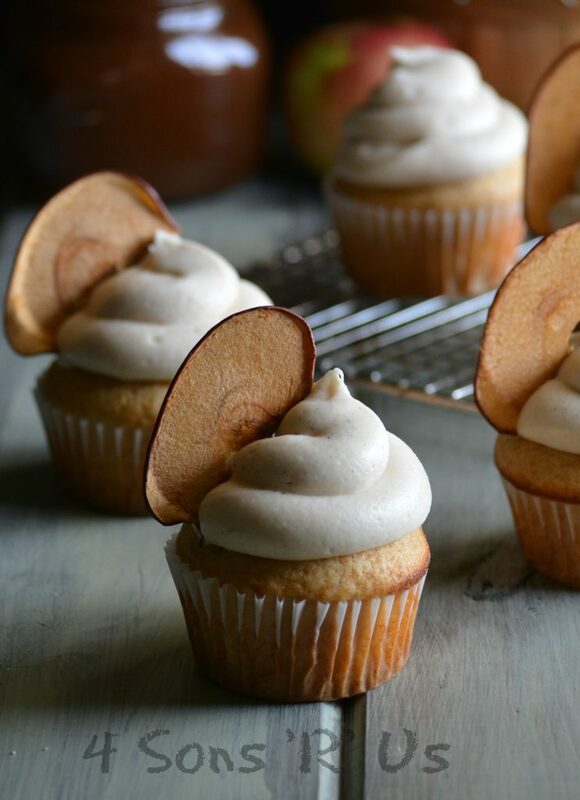 A surprisingly easy from scratch cupcake with the flavors or apple & cinnamon that's perfect for Fall. Add the butter and sugar to the bowl of a stand mixer. Using the paddle attachment, cream them together. Mix in the sour cream and vanilla extract until evenly incorporated. Mix in half the egg whites until evenly incorporated, repeat with the second half. In a medium sized bowl, whisk together the flour, baking powder and salt. In a separate small bowl, stir together the apple butter and milk until smooth. Add half of the dry ingredients to the batter and mix until well combined. Add the apple butter mixture and mix until well combined. Add in the rest of the dry ingredients and again mix until everything's incorporated and the batter is smooth. Line a cupcake pan and scoop the batter into the liners, filling each about half way full. Bake at 350 degrees for 17-19 minutes, or until a toothpick stuck in the center comes out clean. Remove the cooked cupcakes from the oven to cool. After resting in the pan for a few minutes, transfer the cupcakes to wire racks to finish cooling completely. In the bowl of a stand mixer, whip the cream cheese and butter together until fluffy and smooth. Whisk in half of the powdered sugar, mixing until the batter is once again smooth and all the sugar incorporated. Stir in the apple butter, vanilla extract, and cinnamon. Stir in the rest of the sugar, mixing until evenly incorporated and the batter's once again smooth. Using the tip of your choice, pipe a generous dollop of frosting onto each cooled cupcake. 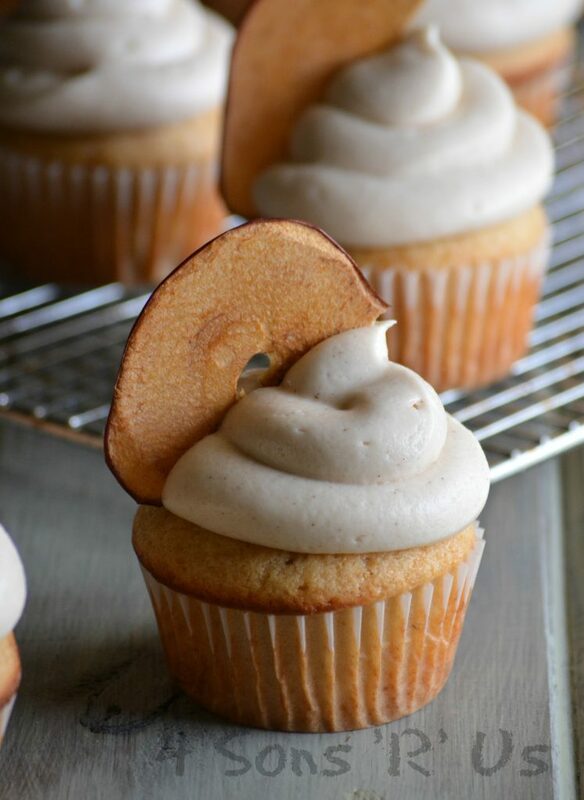 Top each frosted cupcake with a dried apple chip. Serve immediately, or store the cupcakes in an airtight container in the refrigerator until ready. These sound absolutely delicious! Happy FF! They certainly are, and thank you! Happy Fiesta Friday! These definitely evoke images of autumn! 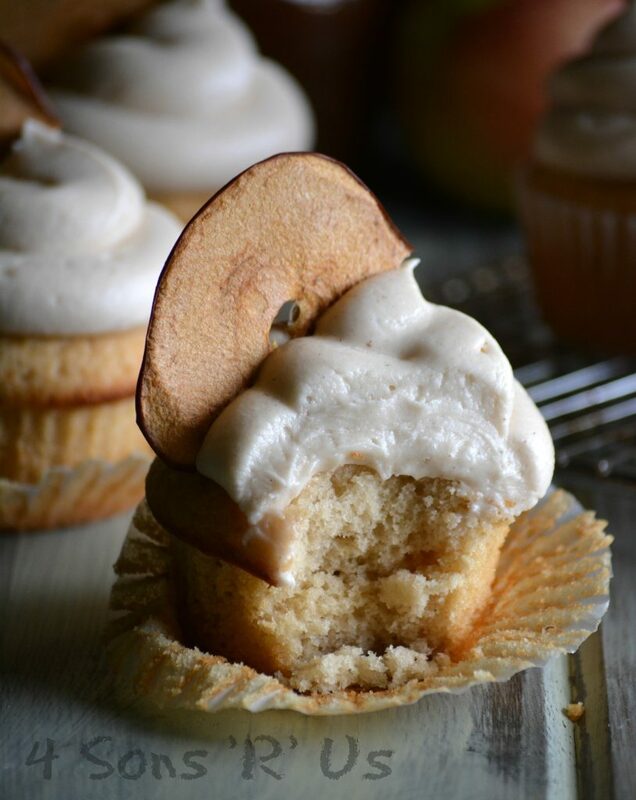 I love how you’ve apple throughout the cupcake and frosting. By the way, how does one make apple butter or is this something that you buy? Cheers and don’t forget to be eligible for features you need to link to Judi’s blog as well as my own and Fiesta Friday! Maggie, while I know you CAN make apple butter, I never have. Around here we’re blessed with local orchards and can buy it a plenty. If not, it can usually be found on store shelves near the jellies. Lauren, it usually makes at least a dozen for me, occasionally I’ve ended up with 13-14.